If your client has a fear of most animals (especially furry ones) then this Fear of Furry Animals hypnosis script download can help them to feel more comfortable in the presence of animals. Whilst we have specific scripts for a fear of certain animals this one encompasses a general fear of animals. Living in fear is terrible for most sufferers - just imagine being unable to visit friends if they have a dog, rabbit or a cat because you just know that you are going to 'freeze' or panic at the sight of the animal. Most fears are irrational and people suffering from any fear often realize this, however it seems to be something that is outside their control. 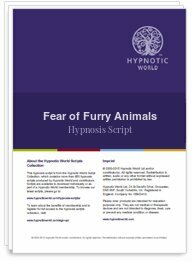 The answer lies in being able to view the fear from a different perspective and this Fear of Furry Animals hypnosis script download can help your client to overcome a fear of furry animals.